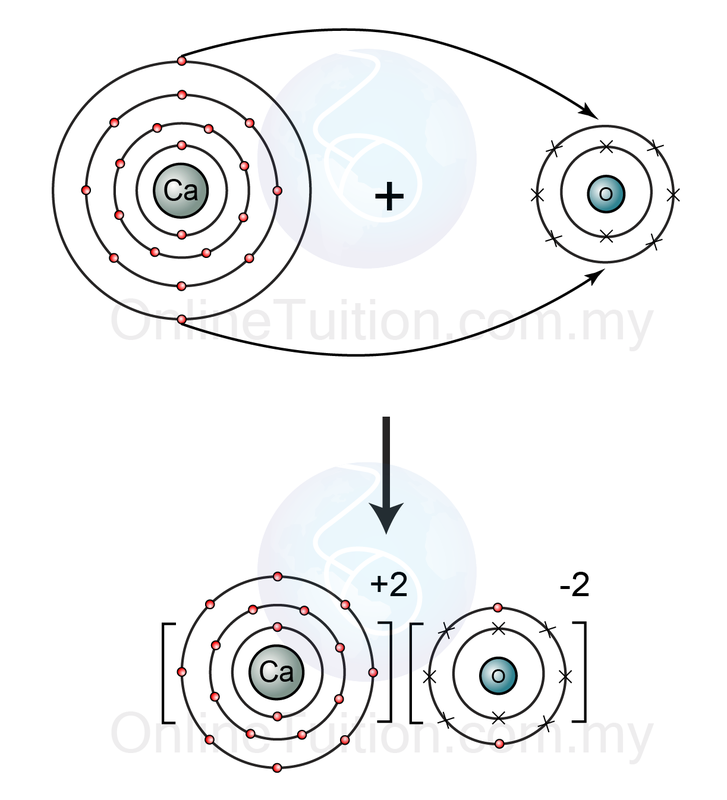 Ionic bonds are formed by one atom transferring electrons to another atom to form ions. Ions are atoms, or groups of atoms, which have lost or gained electrons. The atom losing electrons forms a positive ion (a cation) and is usually a metal. The atom gaining electrons forms a negative ion (an anion) and is usually a non-metallic element. Ions of opposite charge will attract one another by strong electrostatic force, thus creating an ionic bond. Ionic bond is also known as electrovalence bond. Figure above shows the illustration of the formation of ionic bond between a sodium atom (group 1 metal) and a chlorine atom (group 17 element). The electron arrangement of sodium atom is 2.8.1, which is not octet and hence not stable. 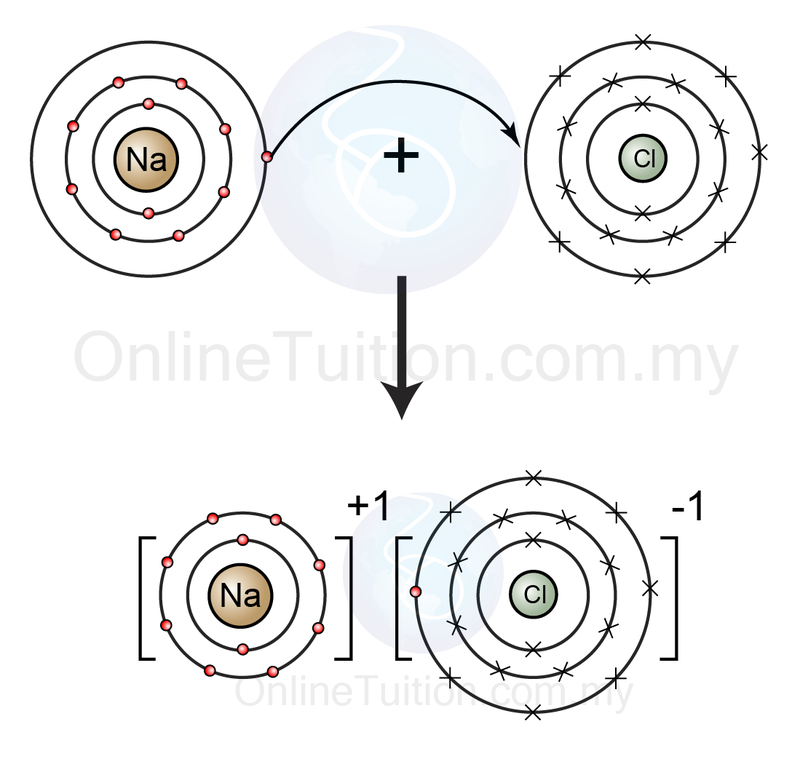 To achieve octet electrons arrangement, the sodium atom donate/release one electron and form sodium ion. The electron arrangement of chlorine atom is 2.8.7, which is also not octet and hence not stable, too. To achieve octet electrons arrangement, the chlorine atom receives one electron from sodium atom and form a chloride ion. The sodium ion and the chloride ion carry opposite charge, hence they attract each other and form an ionic bond between each other. Figure above shows the illustration of the formation of ionic bond between two potassium atoms (group 1 metal) and an oxygen atom (group 16 element). The electron arrangement of potassium atom is 2.8.8.1, which is not octet and hence not stable. To achieve octet electrons arrangement, the potassium atom donate/release one electron and form potassium ion. The electron arrangement of oxygen atom is 2.6, which is also not octet and hence not stable, too. To achieve octet electrons arrangement, the oxygen atom receives two electrons from potassium atoms and form an oxide ion. The potassium ions and the oxide ion carry opposite charge, hence they attract each other and form two ionic bond between the ions. Figure above shows the illustration of the formation of ionic bond between a calcium atom (group 2 metal) and an oxygen atom (group 16 element). The electron arrangement of calcium atom is 2.8.8.2, which is not octet and hence not stable. 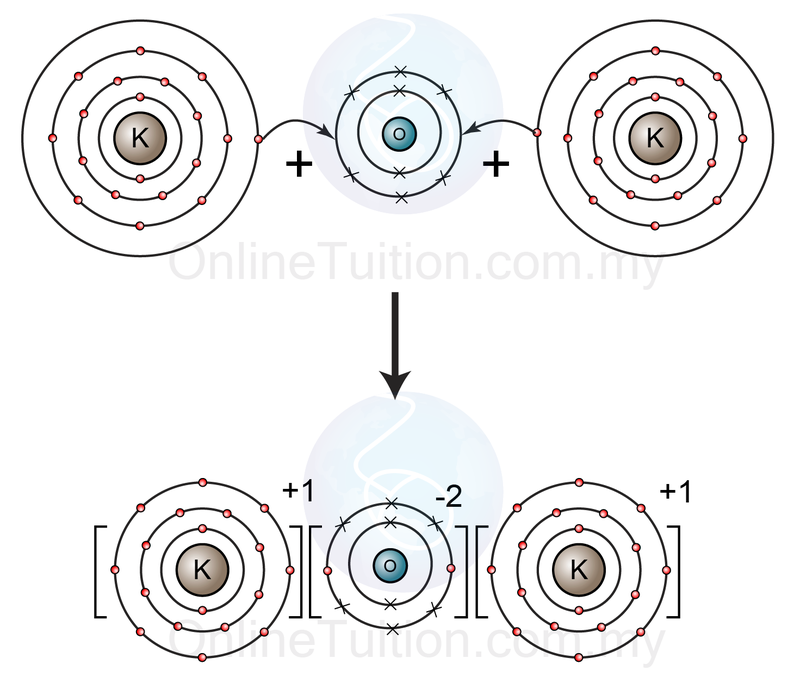 To achieve octet electrons arrangement, the potassium atom donate/release two electrons and form calcium ion. To achieve octet electrons arrangement, the oxygen atom receives two electrons from the calcium atom and form an oxide ion. The calcium ion and the oxide ion carry opposite charge, hence they attract each other and form an ionic bond between each other. We can predict the charge of the ions formed from an element base on the group of the element. From the charge, we can then write the formula of the ionic compound formed. In short, we can predict the formula of an ionic compound if we know the group (in periodic table) of the elements in the compound. Table below shows the formula of the ionic compounds formed by the elements from different group in a periodic table.